Rule: Start with the fine print. One night in Bejing, while chatting over a dinner of numbingly spicy mala xiangguo, three magazine editors and longtime China residents bemoaned the fact that English-language writing about Chinese cuisine was so scant and scattered. Surely Chinese food, so staggeringly diverse, deserved a publication to help introduce it to the rest of the world? Enter The Cleaver Quarterly: eight issues of a critically-acclaimed print magazine produced in collaboration with a global network of foodies, writers, photographs and designers, who left no wok unturned in order to bring their lovingly irreverent takeaway on the globalizing and globalized cuisine that is Chinese food. Our correspondents binged on Chinese military rations, dissected a gigantic Dutch spring roll, scoured rap lyrics for Chinese food references, stalked the elusive chow mein sandwich, and uncovered the key difference between Chinese- and English-language kung pao chicken recipes. Over the course of two years, the magazine's longform writing, cheeky infographics and lush photography found a passionately curious readership eager to digest in-depth stories that slice against the grain. Have you ever wondered about Kublai Khan's philosophy on vegetables, or the dining habits of midcentury Hakka grocery-men in the West Indies, or what sides to serve alongside a main course of roast locust? Or have you only begun to wonder right this second? 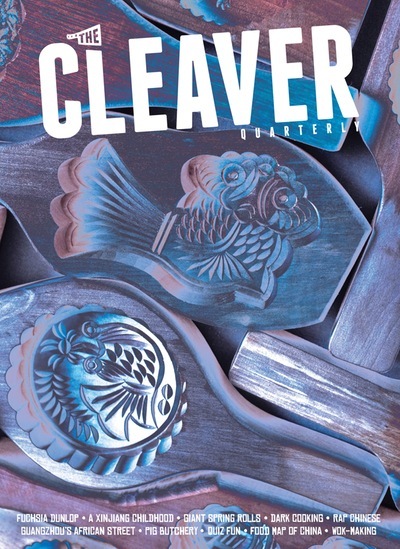 You may just be a proud future owner of The Cleaver Quarterly print magazine. For as long as supplies last, pick up hard copies at one of our stockists in North America, Europe, Asia or Australia, or in our shop. The print magazine is currently on hiatus, but we're excited to explore new intersections of paper, ink and Chinese food. Keep an eye on our social media accounts for teasers of our tasty new print ventures. — Serious Eats, "Fuchsia Dunlop on Chinese Cooking Heroes"
— Bon Appétit, "11 Indie Food 'Zines Worth Adding To Your Coffee Table"
— Gear Patrol, "Our 20 Favorite Indie Food Magazines"
Rule: Judge us by our covers.